All my socks do is sit and plot their escape. The day before I flew to India, a guy in the hotel’s guest laundry room told me that he’d almost gotten in a fight once when a pair of socks turned up missing. We all know that socks are the great self-emancipators of the garment world; they go Steve McQueen from the dryer all the time. Begging the question, why would anyone get so upset over the disappearance of them. He must have seen the incredulity in my face, as he went on to tell me these were “high performance” socks. I don’t know if got my second level incredulity as I thought, High… Performance… Socks? The things you wear on your feet to mop up sweat? 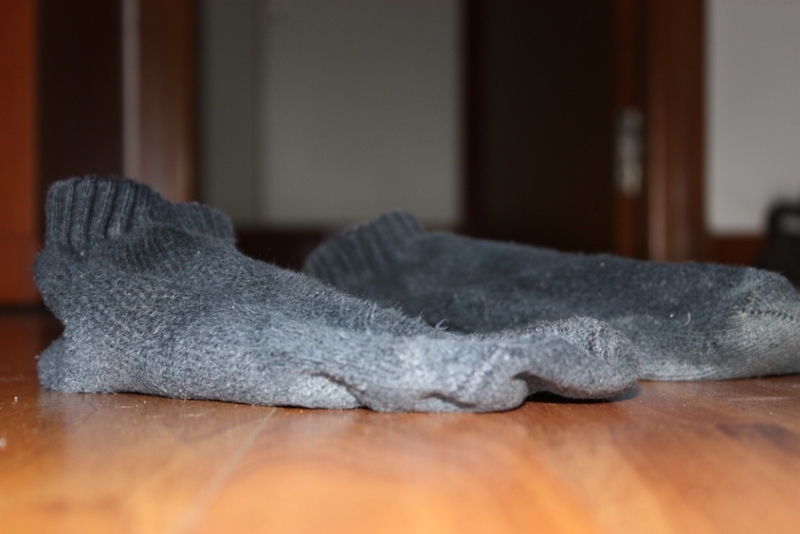 A sock is essentially a foot-shaped bag for your feet. As near as I can tell, the acts it “performs” are: 1.) warming the foot a little, 2.) drying the foot a little (theoretically)–though it can also keep the foot wet longer than it otherwise would be, and 3.) producing stink. In the military we were instructed to wear two pairs of socks. The sock closest to the skin was a cotton sock, and the outer sock was wool. This rationale for this foot sauna was that the cotton sock would wick moisture away from one’s skin, and the wool sock would keep one’s foot warm even when wet. Incidentally, this works great if you are in a cold environment–unfortunately, we haven’t fought a war in a cold environment since 1953. So when I thought about the “performance” at which these socks excelled, I assumed they must keep one’s feet toasty. Wrong! The material seems extra thin. So, they must keep the foot extra dry, perhaps they are embedded with talc or something like that. Wrong again. Surely these socks aren’t better than average at producing foot stench? No. That’s not it. Then I realized there was an other factor on which a sock might be judged: its ability to get people to hand over money in exchange for it. An average pair of socks can garner $3 or $4, but high performance socks can get people to shell over $17 or more. That’s some high performance. Now, I know someone out there will be wanting to tell me about the orthopedic benefits of said sock in supporting one’s arch. This sounds like sock oil salesmen shtick. Is there any fabric known to man that can support your body weight so as overcome in adequate arch support in your shoes? Unless you are Tinkerbell, I doubt it. Perhaps, these socks do have physics-defying properties; maybe we should use them to mend bridges.